This mini macaron display tower is composed of two elements made from clear PVC: container + lid, which protects your macarons during carrying and storage and also serves as a stand when opened. This stand allows you to display French macarons into small pyramids, without having to fix or stick them. All parts are washable and reusable. This pyramid stand is perfect for take away, buffet parties or for display in your bakery. 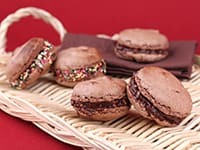 Fits 30 to 35 macarons.